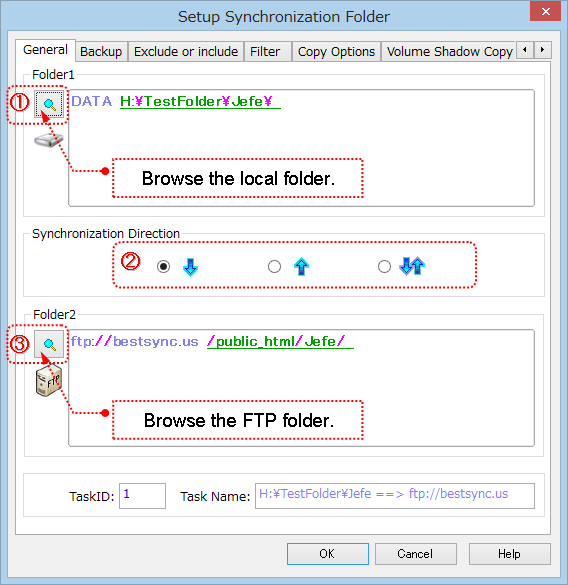 How to synchronize with FTP folder. How to setup a task to synchronize with FTP/FTPS/FTPES server. 1. Click to select the local folder into the "Folder1" edit box. 2. Select the synchronization direction. : One-way synchronize from Folder1 to Folder2. : One-way synchronize from Folder2 to Folder1. 3. Click to select the FTP folder into the "Folder2" edit box. (1). Select "FTP - File Transfer Protocol" in the "File System" list. (2). Setup the parameters for connecting to the FTP server. Server: The hostname of the FTP server, like "ftp.server.com". Or the ip address, like "192.168.10.1". User and Password: The user account. FTP Port: The TCP/IP port, usually it is 21. Please add this port to the exception list of the Windows Firewall and Anti-virus software, otherwise the port may be blocked. Time out: The time length that the connection waits for the data arriving. If data does not arrive in this period, the link is disconnected. Normal: The normal plain FTP. All the commands and files are transferred in plain format, and can be peeped by other people. If the FTP server supports TLS (Transport Layer Security)/SSL (Secure Socket Layer), you can select "FTPS-Implicit TLS/SSL" or "FTPES-Explicit TLS/SSL". If FTPS or FTPES is selected, all the commands and files are encrypted before being transferred over network, so the files are protected from being disclosed. The difference between FTPS and FTPES is, FTPS authenticates the network link by TLS/SSL by default, but FTPES connects to the FTP server first, then negotiate with the FTP server by "AUTH TLS" or "AUTH SSL", then hand-shake with the FTP server according to the response from the FTP server. FTPS-Implicit TLS/SSL: If this option is checked, use "FTPS-FTP over implicit TLS/SSL". FTPES-Explicit TLS/SSL: If this option is checked, use "FTPES-FTP over explicit TLS/SSL". Click here for how to setup certificate of FTPS and FTPES. If FTPS or FTPES is selected , this option is shown. The default state of this option is checked, but if you do not want to encrypt the data again for the sake of performance, or the data has already been encrypted, you can uncheck this option. If this option is ticked, BestSync uses the Passive Mode to connect to the FTP server. In Passive Mode, BestSync sends PASV command to FTP server, then the server replies the port number that the client should use it to connect to the FTP server. NOTE: You must add the port range that the server uses to the exception list of the Windows Firewall and the internet security software; otherwise the connection may be blocked by the Firewall etc. If this option is not ticked, BestSync uses the Active Mode to connect to the FTP server. In Active Mode, BestSync sends "PORT port-number" command to FTP server first, then the server connects to BestSync by the port number in the PORT command. NOTE: You must setup the port range be used in the Active-Mode in the "Active-Mode" tab of the General Option dialogbox, add the port range to the allowed list of the Windows Firewall and the internet security software; otherwise the communication may be blocked by the Firewall etc. If the local computer is behind a firewall or NAT, usually the computer needs the FTP proxy to connect to the FTP server. If this option is checked at the first time, the "FTP Proxy" global option dialog box will be popped up for setup up the settings of the FTP proxy server. The current version does not support proxy when FTPS or FTPES is selected. If "SFTP-SSH File Transfer Protocol" is selected in the "File System" List, the "FTP Proxy" global option dialog box will be popped up for setup up the SFTP proxy server. Click here for how to setup the FTP advanced settings. (3). After setup the FTP host name and account, press "Go" button to connect to the FTP server, the browser begins to list the folders in the FTP server to the tree view. The log window below the treeview logs all the commands sent to the FTP server, and responses from the FTP server. If the connection between BestSync and FTP server can not be established successfully, please check the log. (4). Select the folder in the tree view. "SITE UTIME", "MFMT" or "MDTM"
If the server does not support any of these commands, BestSync uses a database to manage the file information, and can still synchronize files correctly. But if multiple clients synchronize with the same FTP folder, a unchanged file uploaded by other client will be downloaded again. If the local machine and the server are in different time zone, BestSync can detect the time bias between local and server, and adjust the file's timestamp properly. For detecting the time zone of FTP server, the account must have writing privilege on the FTP folder. 4. Press "Next" to set other options, or press "Finish" to end the task wizard. RiseFly Software. All Rights reserved.